We're dedicated to sharing great food spots, shops, products, and information around the world that are in line with our own philosophy. 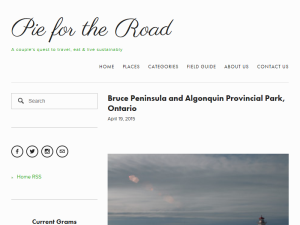 We decided to create this blog because of how difficult it is to find either organic, non-GMO, or local (or all of the above) ingredients, restaurants, and products whilst travelling and in our everyday life. This what your Pie for the Road Blog Ad will look like to visitors! Of course you will want to use keywords and ad targeting to get the most out of your ad campaign! So purchase an ad space today before there all gone! If you are the owner of Pie for the Road, or someone who enjoys this blog why not upgrade it to a Featured Listing or Permanent Listing?